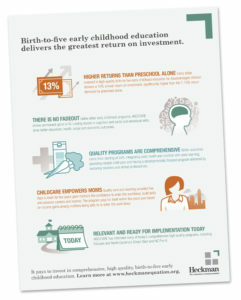 Highlights of the five outcomes associated with high-quality, birth-to-five early childhood education in infographic form. Professor Heckman’s new paper detailing the benefits of high-quality early childhood education, the markers of high-quality programs and the need for society to increase access to these programs for more children. To view the one-pager on this paper, click here.